I was in Sarajevo today to rewrite history with a balloon. I’d dreamt about the happening last week. The dream featured a big red balloon, hovering above the city to the soundtrack of Bijelo Dugme’s Kad bi bio Bijelo Dugme. Go figure. Today our friends at Hstry.co live tweeted a reenactment of Archduke Franz Ferdinand’s assassination in Sarajevo, from the perspective of an independent French journalist. The tweets included the hashtag #WW1live, so we embedded the search timeline on this page and hosted a Soonfeed happening online with a series of live Vines. I arrived with a pistol in my jeans. Security was displeased. Then apologetic. He let me go, and I let the pistol go. I rewrote history with a big red balloon, 100 years on to the minute. At 10.45am on 28th June 1914, a young Bosnian Serb by the name of Gavrilo Princip couldn’t believe his luck. He was standing on a street corner in Sarajevo where, just a couple of metres away, sat Archduke Franz Ferdinand of Austria and his wife Sophie, Duchess of Hohenberg. They were in a procession car that had taken a wrong turn, and the driver was trying to reverse back onto Sarajevo’s main street along the river. Princip drew his pistol and aimed in the general direction of the car. He fired twice. Somehow, the shots found both the Archduke and his wife. Neither survived. One month following the assassination, Austria-Hungary had declared war on Serbia, dragging allies of both sides into the conflict. The Great War had begun, claiming 16 million lives over the four years that followed. Never before had such horror unravelled on a stage so vast. 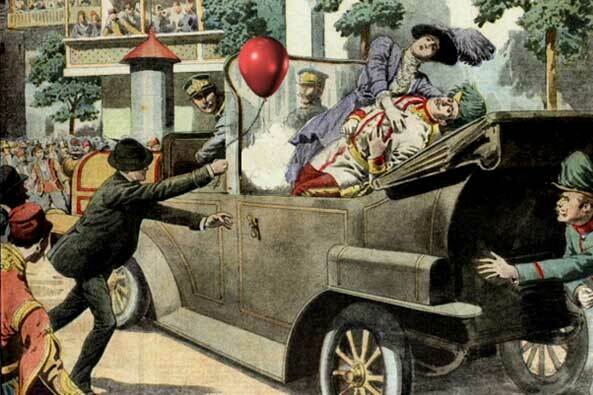 Princip ditches his pistol for a red balloon. What if Princip had come to Sarajevo with a big red balloon instead of a gun? Sophie and Franz would have lived, but what of WW1? As I’m neither a historian nor Captain Hindsight, I have no idea. But most scholars agree that the Balkans had reached a tipping point and that war was inevitable. I’d like to think that no war is inevitable, but boys will be boys. Whether you reckon Princip was a freedom fighter, triumphant terrorist or pathetic pawn, one thing’s for sure. What unfolded on that street corner in Sarajevo pivoted the course of history, ushering in a brave new world of scalable war. If only men loved balloons as much as they love their guns. Soonfeed is a proudly Bosnian startup, so it was about time we hosted a happening in Sarajevo. The hovering red balloon landed in a dream of mine last week. This was our first experiment in live Vining a happening via an embedded Twitter timeline.